Happy Thanksgiving long weekend all! Every Sunday morning at 8 am I recap the week, share what I learned and showcase some of my work! So I'm going to start off by saying I hate making marble cake. There's just so many extra steps involved with it that it just becomes a long dragged out baking process. Plus my recipe has many ingredients that I don't use on a regular basis BUT it is by far a delicious and creamy cake recipe that allows both the chocolate and vanilla to remain the same batter consistency, which is important when you're blending the two. Below is my recipe for my marble cake, note that I don't like blending the batter once it's in the pan, I prefer to alternate the batters to form rings in the pan. Much much easier and it guarantees both flavors in each bite! Have you ever made yourself a mouth watering batch of fresh fish fillets and once it's too late you realize you have no tartar sauce?? This happens to me far too often. Luckily tartar sauce is a combination of household ingredients that are easily located. Here is my recipe for homemade tartar sauce! I'm a big fan of dill in anything, if you're not simply replace it with something of your taste! My latest creation was so much fun! 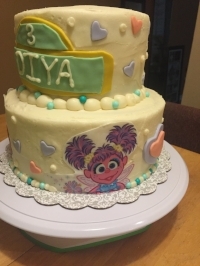 I worked very closely with the mother to make sure Diya's 3rd birthday was perfect in every way! Hosted at Hop Skip Jump! Costco has many delicious foods in their giant warehouses but one thing that I just can’t get enough of is their 3 bean salad! Introduced to us by my aunt, it is now a staple in our meals. The challenge however… Is that we are way too cheap and don’t go through nearly enough food to make our own Costco membership worth it.. Which leaves us at the mercy of my aunt’s shopping schedule. 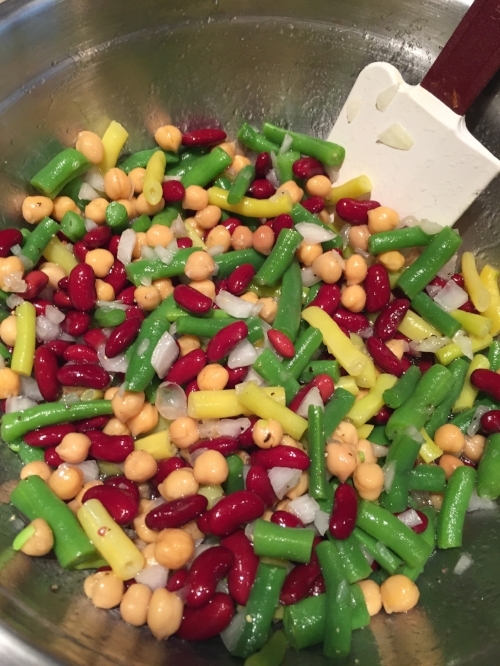 Below is my way around it, my grandmother gave me a huge collection of fresh beans to create something with, and I couldn’t think of a better use than making a nice big batch of 3 bean salad! Looking back at the week it was incredibly eventful! Every Sunday morning at 8am I recap the week, share what I learned and showcase some of my work. This recipe which makes chocolate cupcakes using chickpeas as the base. The recipe is full of things I never use! The cupcakes came out looking great though, at a quick glance you'd never be able to tell the difference! The second challenge was the icing.. fun fact regular icing sugar is cut with corn starch BUT organic icing sugar used tapioca starch instead! The finished project is a tad plain (because sprinkles have flour in them) but it's a sweet bridal gown equipped with a "doctor who" blue belt. I'm incredibly happy I was able to produce something sweet for this bride! Everyone deserves something tasty to celebrate their wedding! Ganache is such a versatile way to bring your baking to the next level. Whether you're using it to cascade over a cake or dipping cookies and strawberries in it, it'll take the reaction from "that looks good" to "get that in my mouth now". Chocolate ganache recipe with milk! Bring milk and sugar to a slow boil, mixing constantly. Once it's to a boil pour over chocolate. Mix everything together until chocolate is all melted. Set aside and let cool until it begins to thicken. Once the desired thickness is reached, used in desired manor. Here's my latest drip cake! A cookies and cream heaven.